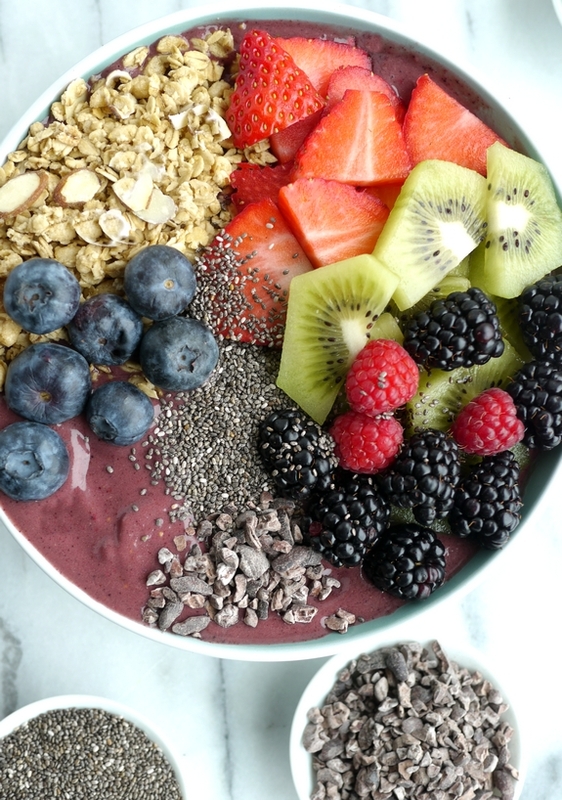 Add this delicious Açaí Smoothie Bowl to your morning routine and you will look forward to your alarm clock going off every day! If you’re drinking your morning smoothie out of a glass, you’re doing it wrong. The first battle is learning how to pronounce “Açaí” correctly….ah-sah-EE. Now that your phonetic struggle is over, it’s time to sit down and enjoy a spoonable smoothie right in the comfort of your own home. Think weekend and pajamas and all this yummy fruit. Some of you have likely been eating smoothie bowls for over a year now. They are so trendy. However, for others, this might be your first introduction to these bowls of deliciousness with endless choices of customizable toppings. 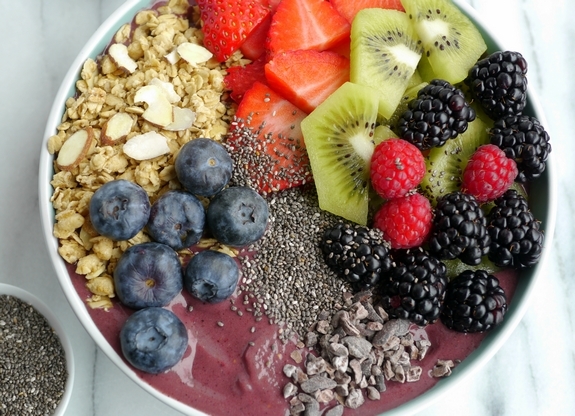 Just remember, smoothie bowls are thicker than regular smoothies, are served in a bowl (obviously), which makes them spoon-ready and ready to eat. Just add your favorite healthy toppings. That’s really all you need to know. This particular recipe is not only topped with my favorite fruits, chia seeds and cacoa nibs, but is blended with nutrient rich açaí powder, a great source of vitamin A, Vitamin C, calcium and other essential trace minerals. And it makes your smoothie bowl taste amazing. Don’t leave it out!! I had my first Açaí Smoothie Bowl last summer in Hawaii (you can see it here). I knew I was hooked. Let’s not mention how refreshing a smoothie bowl was to enjoy after a hike of Diamond Head in some pretty warm temperatures. Since smoothie bowls are made with frozen fruit and not a lot of liquid (which keeps them thick), I would make sure your strawberries and bananas are sliced so it’s easier for your blender to chop them up. A high powered blender is also advised. The topping choices are endless, which is one of the reasons these bowls are so versatile. You can use whatever fresh or frozen fruit you have. Topping with granola adds a nice texture to the final meal. Theya re so good and I can’t wait for you to try one. These are so much better than sipping smoothies through a straw, trust me on that one. 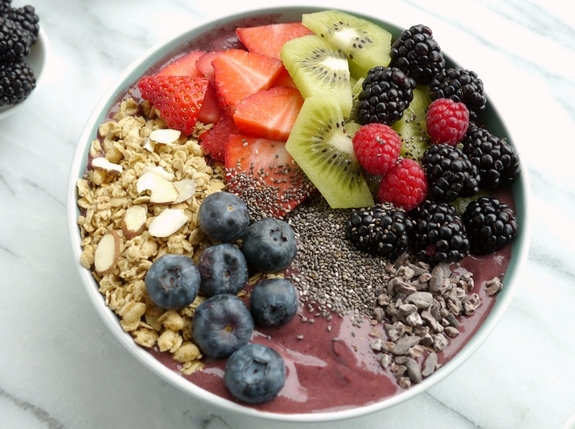 There are so many great recipes out there for smoothie bowls. 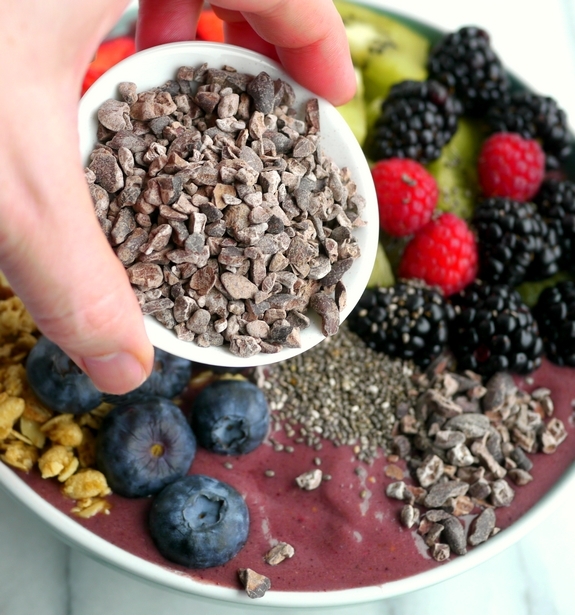 This Banana Chocolate Chunk Smoothie Bowl definitely has my attention. And who would not love a bite of this vacation-worthy Tropical Smoothie Bowl? I know my holidays are going to include this Pumpkin Cinnamon Crunch Smoothie Bowl as often as possible. Five years ago I posted this recipe for Spicy Apricot Ginger Lime Chicken and we’re still loving it. Six years ago these Potted Chocolate Mint Puddings came to life and they are perfect for Spring. If you are looking for the perfect side dish, I made this Soft Polenta with Mascarpone seven years ago and it is still amazing with everything. And eight years ago these Sticky Peanut Butter and Jelly Wings made their debut. fresh strawberries, kiwi fruit, blueberries, blackberries, raspberries, mango, pineapple, sliced almonds, walnuts, chia seeds, hemp seeds, flax seeds, cacao nibs, bee pollen, goji berries and feel free to drizzle with more honey. Add all ingredients to the bowl of a blender and blend until smooth. Add extra milk in small increments if necessary (it is supposed to be very thick like frozen yogurt). You might need a rubber spatula to move fruit around at the bottom of the blender. Spoon the mixture into two bowls and top with a layer of your favorite granola and toppings. What an amaazing way to start the day!! Looks SO delicious!! This is one gorgeous way to wake up! 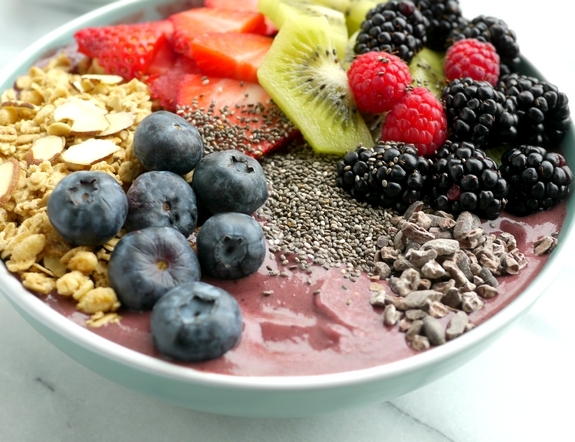 I’ve never made a smoothie bowl at home but this has me craving one! I love all of the toppings! 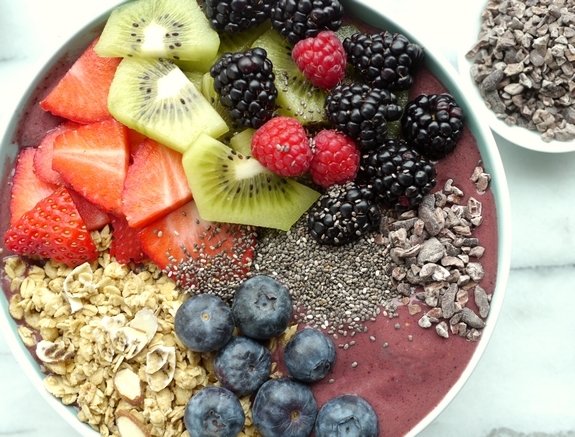 This is such a beautiful and tasty looking smoothie bowl!